12.1″ TFT XGA active-matrix display with a 1024 by 768 native resolution. Apple reports that it also supports 640 by 480 and 800 by 600 when scaled. Standard Optical: 8X/24X/24X/10X DVD-ROM/CD-RW “Combo” drive. Details: Internal support for AirPort Extreme (802.11g) and Bluetooth 1.1, although neither was pre-installed. Details: Two USB 2.0 ports and one Firewire “400″ port. Details: Apple reports that the integrated keyboard has 77 (US) or 78 (ISO) keys, including 12 function keys, 4 arrow keys, and an embedded numeric keypad. The trackpad supports tap, double tap, and drag capabilities. Details: 6 hours under “normal usage conditions” as estimated by Apple. 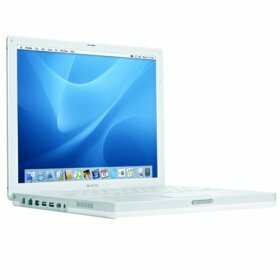 Details: The iBook G4 models are capable of using Mac OS 9 applications within the MacOS X “Classic” environment. They cannot boot into MacOS 9.